‘West Chelborough is a village so far from the haunts of men’, wrote the eminent surgeon and author, Frederick Treves, ‘that the visit of a stranger causes some unrest’. Treves authored one of the most popular books on the county, Highways and Byways in Dorset, first published in 1906 and reprinted numerous times throughout the twentieth century. Having gained fame and fortune as Royal Surgeon to Edward VII, operating on his appendix and saving his life just two days before the planned date of the King’s coronation, Treves retired aged fifty and turned his hand to travel and memoir writing. As the reprints suggest, at this too he was a success. He cycled over 2000 miles around the county to research his book. It says much about his pioneering spirit that in the early years of the 1900s one of the most famous men in the British Empire might be found negotiating a rough chalk track deep in the Dorset countryside on a bicycle, in order to visit remote stretches of coast and largely undisturbed villages. West Chelborough must count for one of these. The country around here is, as Treves writes, ‘an undulating district of valleys and downs, of many trees, of deep lanes shut in by hedges so high that the narrow way is always in shade’. Finding the church, or indeed, the village, isn’t easy. The roads twist and the hedgerows occlude vision; apart from the narrow slip of tarmac that quickly tapers to the next corner everything is green and heavy with greenness, tendrils of adventurous creepers brushing the car. It feels like the road signs have been deliberately primed to send the unwary around in circles but then, suddenly, there is another bend, the surface turns to gravel and here it is, a tiny church and a couple of houses. The lane is so narrow that parking the car against the hedge almost blocks the road. There is nobody around and, at five o’clock on an overcast weekday in June, it is eerily quiet. The church consists of a chancel and an offset, low tower attached to the south side of the nave, through which you enter. The striking font, my reason for coming today, stands immediately to the left of the door. 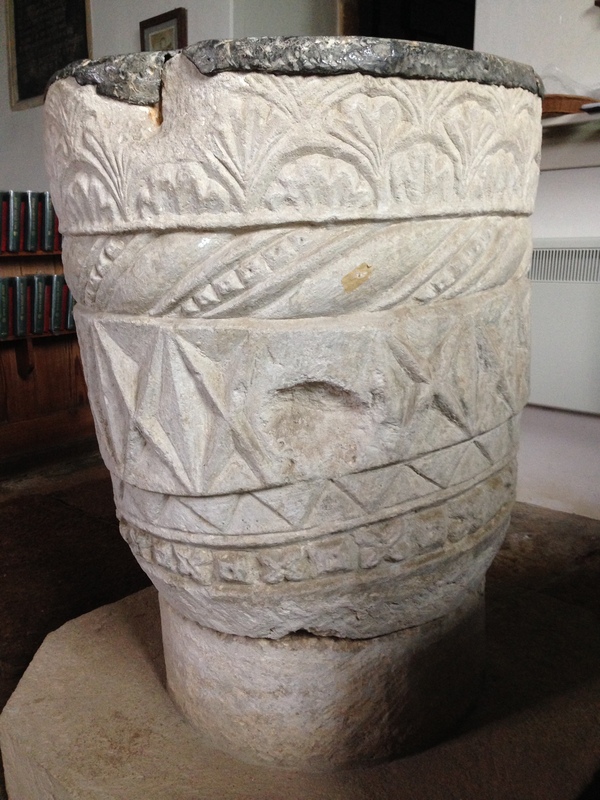 It is a tub shape and carved with five different bands of geometric and foliate ornament. From the top these are: a repeating pattern of leaves, bursts of four at a time forming small palmette-like shapes; cable ornament, the twists alternating between plain and beaded, the latter framed by thin lines; wonderful, upright, rectangular stars; a shallow, saw-tooth style chevron; and at the base a run of dogtooth, a kind of pyramidal star shape. The latter would become a key motif in early Gothic sculpture so its early appearance here suggests a date late in the Romanesque era, probably towards the end of the twelfth-century. Clearly, its passage through the last eight centuries has been an eventful one: there are chunks of stone missing here and there. But to follow the bands of ornament around the bowl is instructive – they are not uniformly horizontal in their layout but instead rise and fall, contract and expand, the decorative strips finding new slopes and gradients as they wind themselves around the bowl. This is likely to be an accident of setting out, or lack of setting out, of the design, though it is far from unusual in Romanesque fonts. In many respects it adds something to the work rather than detracting from it; the variation in the design shows the imperfect hand of the carver quite plainly, adding a warmth it might otherwise lack if everything were straight. (I find later an engraving in Paley’s Illustrations of Baptismal Fonts, published in 1844, in which exactly this has been achieved, the ornament – and the slight cone shape of the font itself – all perfectly straightened, the patterns identical and mechanical). 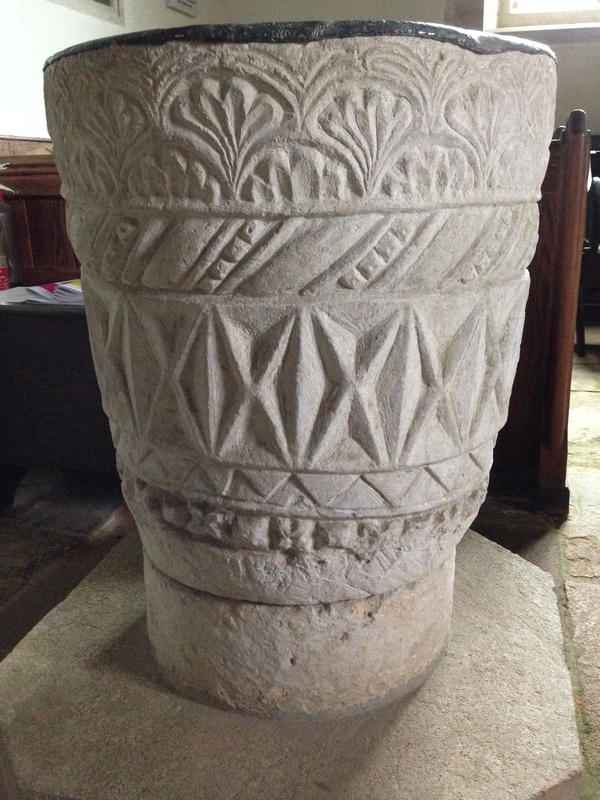 If this font reveals a human presence then so does another feature in the church. Further east in the small nave is an astonishing early seventeenth-century stone tomb, unusually without a date or dedication other than a coat of arms. Like the font this carries an emotional charge, the recumbent figures of a sleeping woman and child tucked into a thick quilt carved by a tender and unfussy hand. The effect is a striking tomb, both for its simple arrangement and understated ornament, as well as for the unusual, almost cartoonish style of the figures themselves. There is an engaging lack of stiffness and formality. Treve noted this monument, identifying the heraldry as that belonging to the Kymer family, but found the work ‘on the whole exceptional and unpleasant’. I agree with him on the former: it is exceptional, and attributed to an exceptional stonemason of the period, William Arnold (c.1560–1637). In the early 1600s Arnold lead an itinerant band of professional Somerset stonemasons who worked on a number of grand houses, of which Montacute in Somerset and Wadham College in Oxford were perhaps the most outstanding. Well-travelled and well-connected, Arnold and his team were much in demand in the period, working on anything from high status projects to individual chimney pieces. Stonemasonry was in the Arnold blood. Born in the village of Charlton Musgrave to a mason who had worked on the rebuilding of Longleat House, his brother Godfrey was a stone sculptor, and at least one of his seven children followed him into the trade. Most of the men who worked with him came from families who lived close to the Ham Stone quarries at Stoke-sub-Hamdon. This connection with the Ham Hill limestone quarries and pattern of itinerant working was nothing new to the stonemasons of the area, however. Go back a few centuries and we find another William, simply known as ‘of Montacute’, producing architectural stonework for Exeter Cathedral in the early 1300s. Some of this was carved off-site, probably at the quarries themselves. William first appears in the Cathedral’s fabric accounts in 1301–1302 and again in 1312–1313. The entries in 1312 connect him with specific types of carving, including two capitals, one head, one great corbel, one great boss and two grotesques. 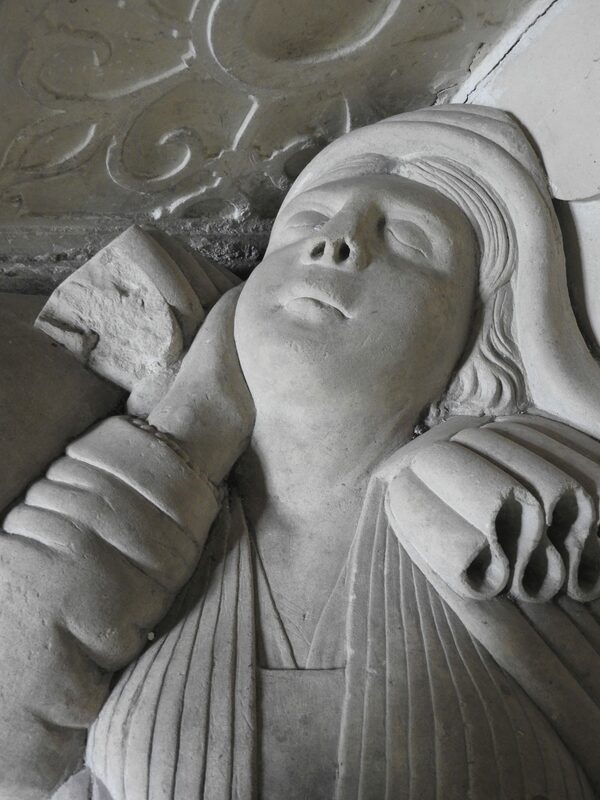 While there is uncertainty in identifying his work, the ‘great corbel’ at the west end of the choir has aroused speculation, carved as it is with the image of St Catherine (the patron saint of the church at Montacute) and a craftsman’s portrait-style head below. Montacute, like Arnold, was a successful mason-sculptor, at one point earning a similar amount to that of the Cathedral’s master-mason in the early fourteenth century, William Luve. Leaving the church I wander around the small yard. A circuit doesn’t take long, and on the way out I bump into three women walking along the path to the porch. They are friendly and ask me what I think of their church. I tell them that I came for the font. I thank them for their suggestions, surprised to find Romanesque sculpture a lively topic of interest among the locals. But of course, this is stone country, I am forgetting myself. In the land that produced both William of Montacute and William Arnold (among many others) the anonymous masons of the twelfth century can rest assured that their work is still appreciated. 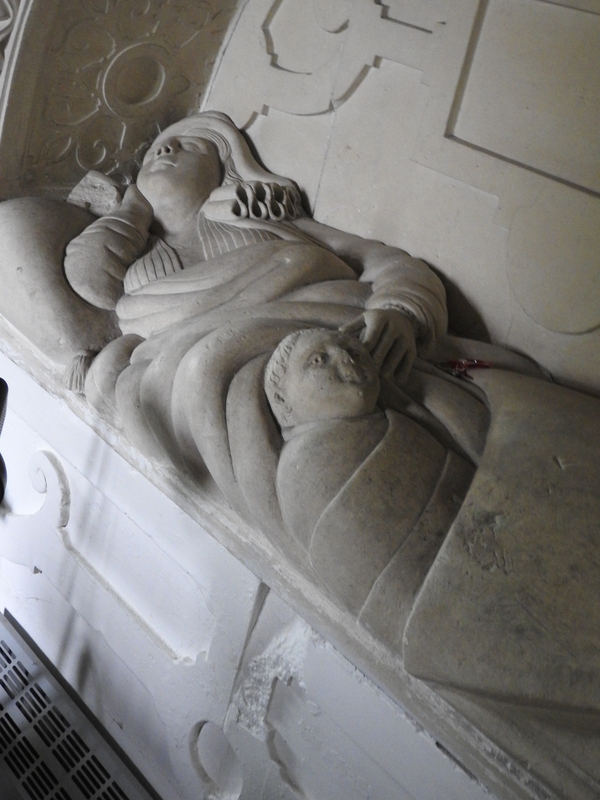 (With thanks to John Goodliffe for the photographs of the Kymer tomb).